Last week, I cast a vote in favor of a bipartisan deal to avert the worst consequences of the “fiscal cliff.” After months of tireless negotiating and frustrating brinksmanship, this proposal passed the House with 90 percent support from the House of Representatives’ Democratic caucus. It was undoubtedly an imperfect deal, one that I would make substantial changes to if the drafting was left solely to me. However, when faced with the bill before me, I believed – on balance – it was best for the country and my constituents to support the proposal, and live to fight for our causes and values another day. First and foremost, this deal prevents our nation from falling back into a recession. If tax increases had been permitted to hit nearly all Americans, as they were scheduled to do, consumer demand and business investment would’ve likely plummeted. Our unemployment rate – which has been on a slow and steady decline – would’ve started to climb. Our already sluggish recovery would’ve been prolonged and potentially endangered our nation’s place as a global economic leader. With so many families just starting to put their lives back together or still working too hard to make ends meet, I could not be an accomplice to any additional economic hardship. Further, this deal provides much needed certainty to the business community just as our economic recovery starts to show real signs of life. Specifically, the extension of the research and experimentation tax credit, of critical importance to Silicon Valley, will fuel another year of groundbreaking technologies – the lifeblood of our district. While it is long past time for this tax credit to be made permanent, I’m pleased that the government will support smart investments like these for the year to come. I look forward to fighting for a permanent R&D tax credit as we face comprehensive tax reform next year. Over the past few years, we all have learned that far too many Republicans in Congress would hold millions of middle-class Americans hostage for sake of tax relief for millionaires. We have learned that they would endanger the full faith and credit of our entire nation and risk sending the entire global economy into a tailspin unless their austerity-only approach wins out. This isn’t responsible governing and it’s dangerous for the future of our country. This time around, I’m proud of our nation’s leaders – President Obama, Vice President Biden, and Senate Majority Leader Harry Reid – that stood firm and fought for the values you and I share. The wealthiest Americans earning more than $250,000 a year will pay a sensible amount more in taxes and share in the sacrifice of bringing our national debt under control; this deal did not include one red cent in benefit cuts to Medicare, Medicaid, or Social Security; and we protected and empowered our nation’s most vulnerable with extensions of unemployment insurance as well as increases to anti-poverty tax initiatives like the earned income tax credit, the child tax credit, and tax breaks that help send kids to college. Frankly, I believe the deal could have been stronger, and that we can ask more of the most fortunate Americans among us. I believe that the reckless and bloated spending at the Pentagon must come to an end. I believe our tax code can be reformed to eliminate wasteful loopholes and get our country growing again. I also know that the debates over our mounting debt are far from over. In the coming weeks, Congress must act to pay the bills we’ve accumulated and raise the debt ceiling. This is an opportune moment to strike a meaningful deal to put our nation on a more sustainable fiscal path. We cannot squander it. I’m encouraged that President Obama continues to insist on a balanced approach – including revenue increases and spending cuts – moving forward. We cannot cut our way to prosperity, and it is only counterproductive to pare back spending in essential areas that help our economy grow – like education, research, and infrastructure. It’s past time for the brinksmanship to end, and for collaborative, bipartisan, pro-growth policies to become the norm. 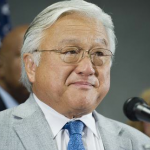 Mike Honda is a Democrat representing the 17th Congressional District, which includes the cities of Cupertino, Campbell, Fremont, Milpitas, Newark, one third of San Jose, Santa Clara, and Sunnyvale. He is a member of the House Budget and Appropriations Committees and chair emeritus of the Congressional Asian Pacific American Caucus.